Noxious weed and woody plant control with backpack sprayers is difficult work! However, backpack sprayers have many positive attributes and are important tools for invasive plant management programs (BOX 1). There are many different types and models of backpack sprayers available on the market, and buying one that fits your needs is important. This article summarizes key points for you to consider before purchasing a backpack sprayer and provides backpack sprayer calibration guidelines and maintenance tips. It also includes reviews of backpack sprayer equipment that some of our readers are currently using in field operations. Primary Use: What is the primary intended use of your backpack sprayer? For example, if you are using mainly oil-based carriers (e.g., for woody plant control) you will need sprayer seals, hoses and pumps that are resistant to oil-based carriers. Backpack sprayers need to be durable especially with multiple applicators using the same equipment! Manual or Motorized (battery powered) Sprayer: Manual sprayers are recommended for treating new infestations. Look for backpack sprayers that allow an applicator to switch the handle for both right and left hand operation. A sprayer that is motorized may be more convenient if you are treating large areas since you don’t need to manually pump a handle to maintain pressure. However, motorized sprayers are generally more expensive, add additional weight, and require more maintenance than manual sprayers. A central element of motorized sprayers is the battery. If you decide to purchase a motorized unit, ensure that the battery is able to handle both low and high sprayer psi output and will work for a minimum of 3 to 5 hours without recharging. Type of Pump: Most sprayers will come with either a piston or diaphragm pump. The piston type pump is less expensive than diaphragm pumps, but may not be suitable for all types of herbicides. If you are using dry-flowable or other dry herbicide formulations, the piston pump may wear out more quickly and need replacement. In general, a diaphragm pump was selected more often by our readers for ease of repair and durability with different formulations of herbicides. Comfort and Safety (reduce risk of herbicide exposure): Small features like a full size pump handle and spray wand grip help reduce operator fatigue. Adjustable, chemical resistant padded straps and a contoured tank provide a more comfortable fit. If the harness is not adequate but you like other features of a sprayer, a padded harness may be purchased separately for some sprayers (see accessories below). Look for Viton type rubber seals that resist swelling and softening, which is often the cause of leakage and pump breakdown. Spray Wand: A quality spray wand is less prone to leaks and is important for operator comfort and accurate application. Look for wands that accept the TeeJet nozzles and caps, which allow you to choose from a wide assortment of industrial grade tips that are sold by local suppliers. Durability and Ease of Repair: The backpack sprayer tank should be composed of high-density polyethylene with UV protection. Hoses, seals and other accessories should be rated for herbicides and additives you will be applying. Repair parts should be available to rebuild components such as pumps. Following are some ideas you may want to consider for upgrading your backpack sprayer. Figure 1. Spray wand for LVB applications showing mechanical shutoff at the tip (Photo MN Wanner, www.4-control.com). For applications near sensitive desirable plants, factory wands can be upgraded with units that have the shut off mechanism at the spray tip rather than back at the handle. This feature will virtually eliminate unwanted dripping (FIGURE 1). Wands can be customized with straight or curved extensions up to 48 inches. A pressure regulator device built into the sprayer or added as an accessory to the spray wand (e.g., calibrator valve) can help maintain a constant spray pressure. A pressure regulator allows more consistent application, reduces drift, and prevents unwanted pressure spikes. 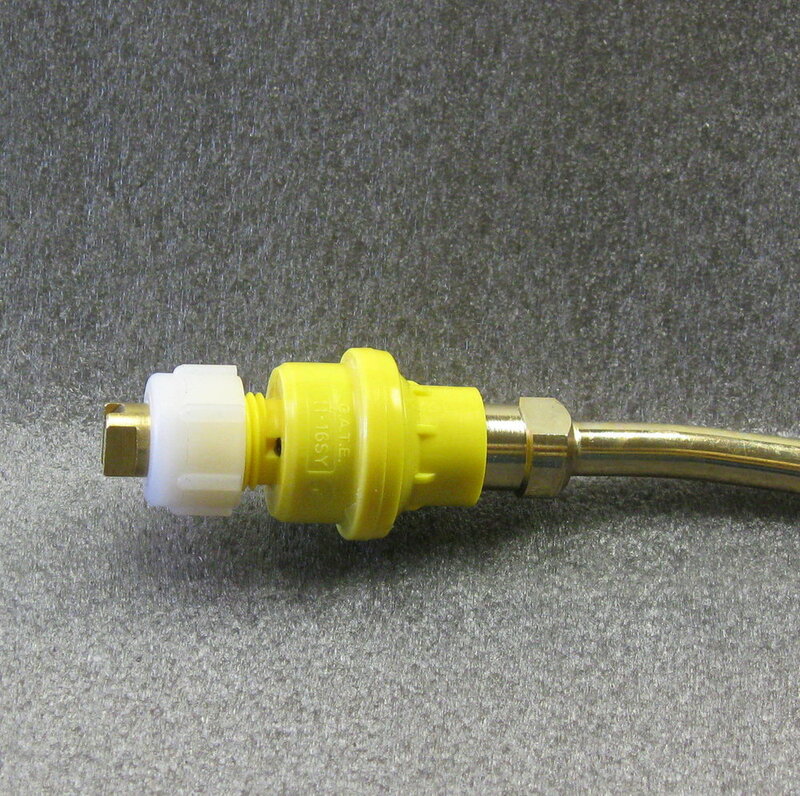 Add quick couplers that allow the spray wand to be removed for easier transportation and storage. Improved harnesses can provide comfort and protection to the applicator. The harness must have waterproof pads to prevent chemical saturation (read below for recommendation from our readers (Box 2). Thorough cleaning after every use is essential for the longevity of a backpack sprayer. Your backpack sprayer will last longer and require less repairs if you rinse the equipment thoroughly at the end of the day with clean water or a commercial tank cleaner. Lubricate seals and o-rings periodically (at least once per year). In colder climates you need to winterize your sprayer before storage. Be sure to add either automotive or RV antifreeze to prevent damage due to freezing. Automotive antifreeze is less corrosive to spray equipment pumps and seals than RV antifreeze. However, automotive antifreeze is toxic and must be collected for reuse or disposed of properly. RV antifreeze is non-toxic and may be sprayed on the ground. (3) Uniformly apply the herbicide solution to the target plant. The Deluxe Shoulder Saver Harness can lessen fatigue with backpack spraying. Cost: About $43.00 depending on mfg. Thick, padded, adjustable shoulder straps and padded, adjustable waist. Adjustable chest strap keeps shoulder straps from slipping off your shoulders. Waterproof pads prevent chemical saturation and protect your skin. Provides thicker straps with more padding and a wide waist belt than comes with backpack sprayers. Having them definitely makes a day of backpacking more enjoyable! The shoulder straps are worth their weight in gold. TechNote published: 8/1/2012; Updated April, 2019.